Check in was fast, staff helpful, breakfast was good, beds comfortable. It was 5 min (if that) from mall and highway. We would return again. The staff was very friendly and helpful. I liked the different varieties of breakfast. Where to find Tipp City hotels near an airport? Where can I find hotels in Tipp City that are near tourist attractions? Tipp City offers travelers 19 Expedia places to stay. Just a short drive from Tipp City's downtown area you'll find 19 Expedia-listed hotels. 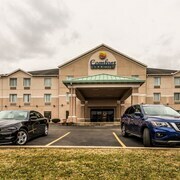 You will find Holiday Inn Express Hotels and Suites Dayton North Tipp City and La Quinta Inn & Suites Dayton North - Tipp City within strolling distance from central Tipp City. You could check out the Residence Inn by Marriott Dayton Beavercreek and the Marriott at the University of Dayton. The Residence Inn by Marriott Dayton Beavercreek is positioned 20 kilometres (13 miles) away from the middle of Tipp City. The Marriott at the University of Dayton, is situated 25 kilometres (14 miles) away. 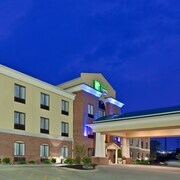 The Residence Inn Marriott North and the Inn Port are two alternative places to stay in Tipp City. For those keen to see more of the rural landscapes common in this area, you could also book a few days in other parts of Southwest Ohio. Go cycling or make a trip to the region's attractions. Comfortable hotels are available. 20 kilometres (13 miles) to the south of Tipp City is Downtown Dayton, where you can explore Arcade Square Shopping Center and Warped Wing Brewery. If you'd like to stay in Downtown Dayton, be sure to check out the Courtyard by Marriott Dayton-University of Dayton and Crowne Plaza Dayton. Or stay in Huber Heights, 10 kilometres (6 miles) to the southeast of Tipp City, where you'll find the Holiday Inn Express Hotel Dayton-Huber Heights and Hampton Inn Dayton/Huber Heights. While visiting Huber Heights, a couple of places to add to your itinerary are the Carriage Hill MetroPark and Rose Music Center at The Heights. Consider spending a few hours rubbing shoulders with fellow sports fans at a local match. You'll find Paul Brown Stadium 100 kilometres (61 miles) to the south of Tipp City. For visitors who are interested in sleeping nearby, make a reservation in the 21c Museum Hotel Cincinnati or Residence Inn by Marriott Cincinnati Downtown/The Phelps. If you are planning on arriving or departing via James M. Cox Dayton International Airport, you may choose to book a room at Super 8 Vandalia / Dayton International Airport, or Airport Inn and Parking/Dayton International Airport, which are both close by. What are the most popular Tipp City hotels? Are there hotels in other cities near Tipp City? 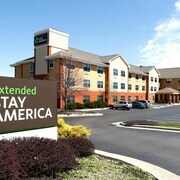 What other types of accommodations are available in Tipp City? Explore Tipp City with Expedia.ca’s Travel Guides to find the best flights, cars, holiday packages and more!